Renowned red carpet and bridal gown Australian designer Steven Khalil has dressed the likes of Beyoncé, Jennifer Lopez and Nicole Kidman. 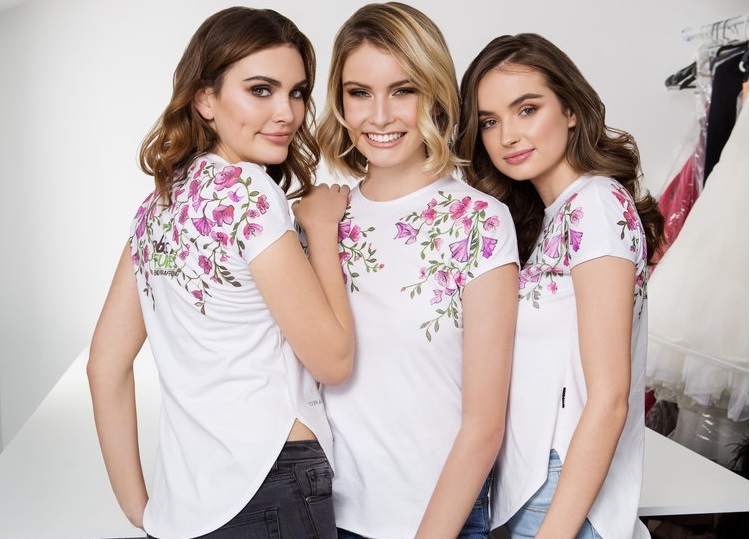 Casual lifestyle brand Citizen Wolf, who believe in producing ethical, local and sustainable clothes, has also teamed up to create the organic charity t-shirts. “100% of the profit goes directly to helping end modern slavery and cover a range of services from medical treatment to psychological service. One t-shirt equates to one bicycle for a child to independently attend school each day which means opportunities for future independence and employment. Five t-shirts cover all resources for the outreach program for one month, providing soap, education and food to women and children living in circumstances of homelessness and sexual exploitation,” said Ms Pearson. As an organisation committed to strong ethos and the fair treatment of workers, the shirt was made from organically grown-cotton from India and knitted in Melbourne. The shirt was then designed, cut, sewn and screen printed in Sydney using organically certified water-based inks. Consumers can be confident in their purchase as it not only transforms the lives of those affected by slavery and exploitation in Australia and Cambodia, but promotes environmental sustainability and better working conditions for the people involved in its creation. Zoe Marshall, Australian media personality, and soon-to-be mother, is one of the celebrity ambassadors as issues relating to women and children in need have always been close to her heart. The exclusive Steven Khalil charity tee is available for pre-order from the Project Futures website. Each shirt is retailing for $99.00 and will be ready for delivery from the 13th of November 2017. Project Futures was founded in 2009 by Stephanie Lorenzo to educate and empower people to take action against human trafficking and slavery. Project Futures strongly believes that no human being should ever belong to another, nor should they be exploited for profit or pleasure. Through the implementation of initiatives such as AFESIP Cambodia and The Freedom Partnership, Project Futures has been successful in improving the quality of life for women and children who were previously at the hands of their oppressors. Some of their many achievements include providing over 70 English Language training sessions, 438 clinical counselling sessions in and over 3,000 nights of safe refuge in 2016. Project Futures will also host a High Tea Fundraising Event on the 12th of November 2017 to support victims of forced and early marriage in Australia. The event will be held at Doltone House in Sydney and tickets are retailing at $95.00 per person and $720 for a table of eight. For more information, visit www.projectfutures.com.